Moster Roth, Belmont Wafer Rolls, and traditional treats are available on pg 2-3. 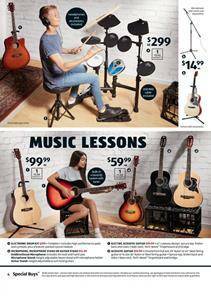 Musical instruments including electronic drums, acoustic and classic guitars, keyboard, flute, and musical books and instructions are available on pg 4-5. These are particularly good gifts for kids who are interested in learning and composing music. Also, see the details about the household products like cleaning supplies, microfibre cloths, disposable gloves, and more items. Steam Mop with soap dispenser, Bath and Shower cleaner or multi-purpose cleaner, and much more can be found on the latest Aldi Catalogue. I think this Aldi Catalogue is one of the best since the beginning of 2019.